Translate between decimal and fraction notation, particularly when the decimals are repeating. Create and solve simple linear equations to find the fractional equivalent of a repeating decimal. Understand the effect of multiplying a decimal by a power of 10. Before the lesson, students attempt the Repeating Decimals task individually. You review their work and write questions for students to answer in order to improve their solutions. A whole-class discussion is used to introduce students to some of the patterns in repeating decimals and a method for converting such decimals to fractions. Students work collaboratively in small groups on a matching task that requires them to translate between fractions, decimals, and equations. In a final whole-class discussion, students compare and evaluate the methods. In a follow-up lesson, students review their initial solutions and then complete a different Repeating Decimals task. Each student will need the task sheets Repeating Decimals, Repeating Decimals (revisited), and Fraction Conversion Challenge, a calculator, a mini-whiteboard, a pen, and an eraser. Each small group of students will need Card Sets A: Decimals, B: Equations, C: Fractions, a large sheet of paper for making a poster, and a glue stick. You may want to copy the Card Sets onto transparencies for use on an overhead projector. There is a projector resource to remind students of the instructions for the group activity. 15 minutes before the lesson, a 1-hour lesson and 20 minutes in a follow-up lesson (or for homework). Timings are only approximate. Exact timings will depend on the needs of your class. 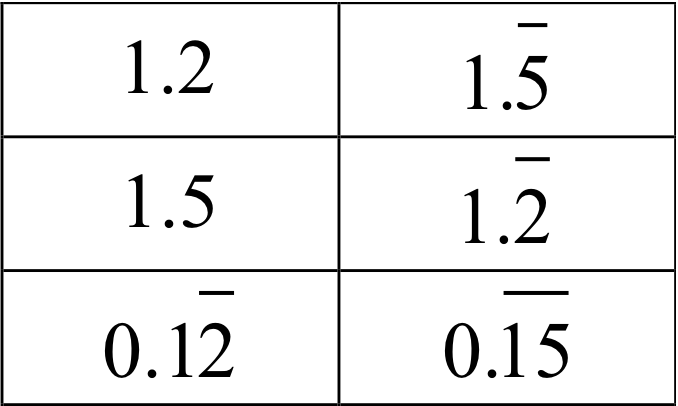 8.NS: Know that there are numbers that are not rational, and approximate them by rational numbers.